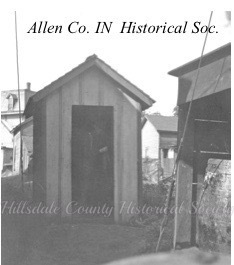 A misinterpretation by an early Hillsdale historian has resulted in decades of misinformation regarding the Detroit, Hillsdale, and Indiana right-of-way granted through the City of Hillsdale. The train trestle which crossed Broad Street near the Fairgrounds and headed southwest was not "30 ft. high." The span was 30 feet, crossing over Broad Street, with a height of 13.5 feet. A May 21, 1895 edition of the Hillsdale Standard reported "a New York Central coach filled with children was attached to the fast moving train west last Wednesday. The little ones were foundlings bound for homes in the west." In 1902 the New York Times reported the Lake Shore Railroad line has "two large greenhouses with competent florists in charge." One was at Mentor, Ohio, while the other was reported as being situated at Hillsdale, Michigan. the lake shore and michigan southern railroad roundhouse, with the freed brothers flour mill across railroad street, now carleton road. the roundhouse and turntable were dismantled in the 1950s.